A bill passed this month by the U.S. Senate could get Veterans Treatment Courts more funding, including those in Montana, along with the staff needed to help vets in legal trouble get back on their feet. 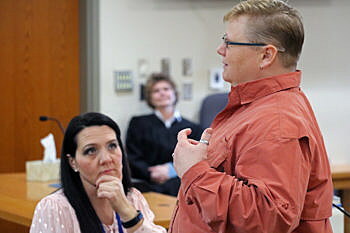 Co-sponsored by Ranking VA Committee member Sen. Jon Tester and Sen. Steve Daines, the bill would hire 50 additional outreach specialists to serve in Veterans Treatment Courts nationally, and improve access to substance abuse and mental health care. In Montana, the courts are located in Missoula, Great Falls, Bozeman and Billings. Under the strict guidelines of the court, the process works to remove vets from the criminal justice system and help them address such issues as post-traumatic stress disorder and substance abuse. Co-Occurring Treatment Court with Veterans was founded in Buffalo, New York, in 2008. The program found its start in Missoula in 2011, making it the first court of its kind in Montana. The effort blends a number of resources, from the VA Montana Health Care System to local prosecutors, public defenders and a team of volunteer mentors. Together, they guide veterans through a structured rehabilitation program tailored to meet their specific struggles. While the program has long struggled for reliable funding, Missoula Standing Master Brenda Desmond called the bill a step in the right direction. Since the Veterans Court program launched in Missoula, it has recorded an 80-percent graduation rate. But for most of the past seven years, it also has struggled for funding, even though it costs less than $100,000 annually to operate. “The Veterans Treatment Court Improvement Act of 2018 marks an important step towards carrying out America’s longstanding commitment to Veterans,” Desmond said.